Can a native also be considered invasive? (photo: Eastern Oregon grassland with encroaching Western juniper. Photo courtesy of Oregon Department of Agriculture). 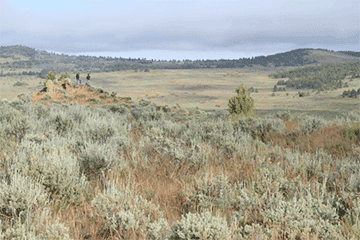 Dan Hillburn, administrator of the Oregon Department of Agriculture Plant Division, blogged on Saturday about the dilemma posed by Western juniper (Juniperus occidentalis) choking out grassland habitat in Eastern Oregon. So what to do? Logging the trees is cost prohibitive for what wood they can provide, and burning them would probably engender public opposition. Hillburn sits on a working group that is trying to tackle the problem, while Oregon State University is coordinating an ongoing effort to find other commercial uses for harvested junipers. The Oregonian newspaper (Portland, Ore.) ran an article in February talking about the problems.